Our wonderful PR Friendly, Holiday Gift Guide 100+ Bloggers think that La Bella Baskets has something everyone will love this Holiday Season - we just can not keep it to ourselves. La Bella Baskets gift selection offers beautiful gifts for special occasions such as birthdays, anniversaries, baby showers, wedding/romance and special holidays. For sensitive occasions, our sympathy and get well baskets can convey your deepest sentiments. La Bella Baskets, gift selection offers something for everyone. Whether you're looking for something for the chocolate, coffee, or fine cheese lover in your life, or seeking a tasteful gift for a business or corporate function, you'll find what you're looking for with our baskets. Our gifts are the perfect idea for any occasion. We have over 400 gifts and they are always changing with the season's and holiday's. Our basket store is full of gifts for women, men, teens, children and infants. Our Fall gifts are currently in the store and the Christmas gifts will be out very soon. La Bella also offers a personalized gift store with 600 gifts to choose from. We have personalized keepsakes for your family and friends. From wine and beer glasses to picture frames, jewelry and candles. Personalized gifts for women, men, teens, children and infants. Come back to the personalized gift store often as the gifts here change with the season's and holiday's as well. Check out this incredible Wonderland Tower of Goodies - Perfect for anyone on your holiday shopping list. This delightful silver and red snowflake tower evokes a winter wonderland and is a great way to wish someone Happy Holidays this season. Each silver box holds a different sweet treat, including peppermint crunch bites, chocolate covered pretzels, mint chip malt balls, Ghirardelli assorted chocolate squares, chocolate chip cookies and red green and white jelly beans. Ho, ho, ho! 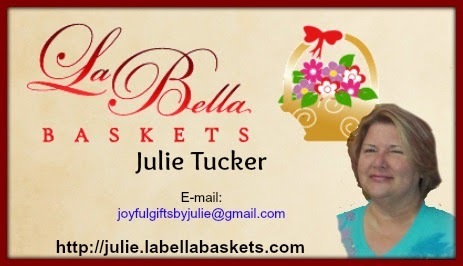 Meet Julie / La Bella Baskets Consultant...... Julie resides in Georgia with her wonderful husband and terrific son. We have lived here for 24 years. Even though I'm from the Midwest I now call Georgia my home. Julie has been a consultant with La Bella Baskets since 2012 and can help you find the perfect gift for anyone on your list. You can also follow her Blog Joyful Gifts to learn more !